Good morning ... So, they're thinking a supernova might have killed off the megalodon. Or, put another way, a giant space explosion might have killed the giant prehistoric shark, which sounds a lot like something I might have dreamed up when I was about 11. President Trump wants Congress' help enacting his agenda on drug pricing, but members of Congress aren’t sure yet whether they want to provide it. 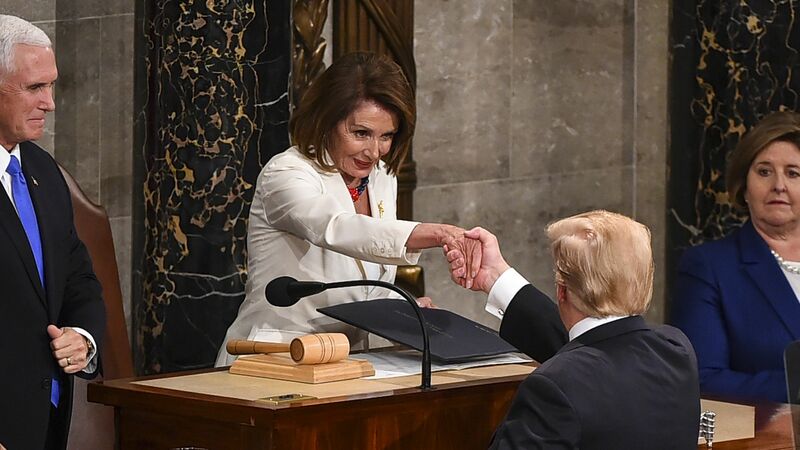 Driving the news: "I am asking the Congress to pass legislation that finally takes on the problem of global freeloading and delivers fairness and price transparency for American patients," Trump said last night. "We should also require drug companies, insurance companies, and hospitals to disclose real prices to foster competition and bring costs down." Between the lines: "Global freeloading" is a reference to his plan to base some Medicare payments on European countries' prices — a plan conservatives do not like. The administration has also proposed major changes in the way pharmacy benefits work in Medicare and Medicaid, but it needs Congress' help to extend to those changes into the private insurance market. What they're saying: House Speaker Nancy Pelosi was not enthusiastic about Trump’s pharmacy proposal, and Sen. Rob Portman (R-Ohio) told my colleague Caitlin Owens he's still on the fence, too. "I looked at their analysis and they have a half dozen different potential outcomes. It's just hard to analyze it when the estimates are all over the place," he said. But Senate Health Committee Chairman Lamar Alexander (R-Tenn.) told Caitlin he likes the plan. Quick reality check: Trump also said last night that "as a result of my administration's efforts, in 2018 drug prices experienced their single largest decline in 46 years." He's referring to the change in the consumer price index for prescription drugs, which only fell by 0.6%, and is an incomplete picture to begin with. It's not a measure of how much the U.S. as a whole spends on drugs. Estimates from Altarum Health suggest total national drug spending increased by 5% last year. More importantly, none of Trump's big ideas on drug prices are in effect yet, and were not in effect last year, and therefore could not have had much impact on last year's prices. The administration is already rolling out more details about one of Trump's most ambitious State of the Union pledges: "to eliminate the HIV epidemic in the United States within 10 years." By the numbers: Roughly 40,000 people get HIV each year, and that rate has held steady for a while now. More than half of all new HIV infections are concentrated in just 48 counties, as well as Washington, D.C., and San Juan, Puerto Rico, according to the Health and Human Services Department. How it works: With HIV, as public-health experts like to say, "treatment is prevention." There's no cure for HIV, but if patients adhere to their treatment regimen long enough, the virus can become so deeply suppressed that it's undetectable in their blood — and once it's that weak, it also can't be transmitted. The bottom line: If you really could get enough people tested (about 165,000 Americans don't know they're HIV-positive, per HHS), and help patients access and stick with drugs to treat the virus, that really could make a difference. The goal will be to reduce new infections by 75% in the next 5 years and by 90% in the next 10 years, HHS said. 2019 is going gangbusters for health care startups. They raised more than $2.6 billion in venture capital just last month, according to a Pitchbook analysis conducted for Forbes. That’s a 37% jump over last January. Winners: BridgeBio, a biotech startup focused on oncology and rare genetic diseases, which led the pack with $299 million in funding. Yes, but: It may not last. Per Forbes, health care analysts from Morgan Stanley and Bank of America recently said they expect to see health care VC activity decline this year. Centene, the sprawling health insurance company that only sells Medicare, Medicaid and Affordable Care Act plans, posted another huge year with $900 million of profit on more than $60 billion of revenue in 2018. Driving the news: ACA business played, and will continue to play, a relatively significant role for Centene, my colleague Bob Herman reports. Centene's ACA plans had profit margins "between the 5% and 10% range," CFO Jeff Schwaneke said on an earnings call yesterday. It helps that Centene targets healthy, price-sensitive shoppers. Centene estimates it will have 2 million ACA members this year, or more than 17% of the ACA marketplace based on the latest figures from Charles Gaba's ACA Signups blog. The bottom line: Health insurers are making bank on government-funded insurance programs. WellCare Health Plans, a leading competitor to Centene, registered $440 million of profit on $20.4 billion of revenue in 2018 and expects about $26 billion of revenue this year. Between 2007 and 2017, cancer deaths increased from 7.6 million to 9.6 million globally. And the vast majority of that increase was in low- and middle-income countries, Thomas J. Bollyky, a senior fellow at the Council on Foreign Relations, writes in Axios Expert Voices. The big picture: In wealthy nations, lower smoking rates, personalized medicine, and novel treatments like immunotherapy are reducing cancer rates and improving survival, even among aging populations. But that progress isn't reaching poorer nations, which saw 80% of the increase, especially in South Asia and sub-Saharan Africa. Those countries need international investments to improve their health infrastructure, but in the meantime, efforts to increase tobacco control and vaccinations to prevent cervical cancer would also help.